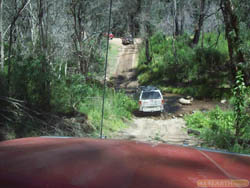 Haunted Stream Track runs parallel to the Haunted Stream and comprises 54 river crossings, they were fairly shallow. Access to many sections of the stream from the track is difficult due to steep!! overgrown banks. (Some lift is needed) magnificent display of tree ferns lining the Haunted Stream Valley. And with good camping on some of the banks makes It a good trip for the family.Track ends at Dowson City Campsite. Added by adzee - Went through November 15th 2011 and it was completely different to Jan 2011. Water has eroded creek entry/exits and made them fairly sharp. Large trees down, however there has been track made to pass. I would rate medium to difficult, water is in every creek crossing now.